Dante Alighieri took a dim view of Papal resignation, consigning Pope Celestine V, who resigned his office after serving only five months in 1294, to the anteroom of Hell. Who lived without infamy or praise. The (regarded by the Church, and scholars generally, as apocryphal) Papal Prophecies allegedly received in a vision by St. Malachy, 12th century Bishop of Armagh, interestingly predict that there will only be one more pope after Benedict. 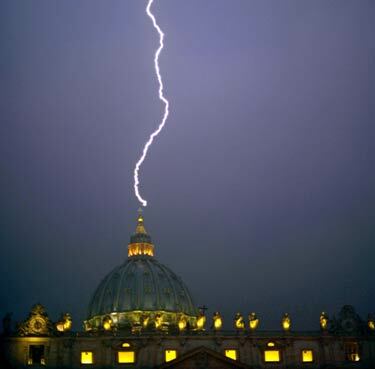 The next pope will preside over the Church in a time of persecution. The city of Rome will be destroyed, and the Last Judgment will arrive. In psecutione extrema S.R.E. sedebit. Petrus Romanus, qui pascet oues in multis tribulationibus: quibus transactis ciuitas septicollis diruetur, & Iudex tremendus iudicabit populum suum. Finis. I thought I was pretty much the only pedant likely to know about the Prophecies of St. Malachy, but I found that the Irish Central was up on all this, and actually beat me to the punch in informing contemporary mankind on the world’s imminent end. Militant muslims planned a coordinated hacking attack last week on the Pope’s web-site, as yet another expression of Islamic indignation at the Pope’s recent speech arguing that religious faith cannot be legitimately coerced. Not altogether surprisingly, in this technological battle between a reactionary Western institution embodying the outlook of the Scholastic Middle Ages and adherents of the backward cult clingng to the moral and cultural values of the Middle Eastern Dark Ages, the former won. As at Tours in 732, as at Jerusalem in 1099, as at Lepanto in 1571 and Vienna in 1683, the green crescent flag went down in confusion and defeat before the Cross. Lee Harris, in the Weekly Standard, interprets the Pope’s recent speech (which so thoroughly upset the Saracens) as a message to the modern rationalist secular community of the West. To the modern atheist, both (the Christian and the Islamic) Gods are equally figments of the imagination, in which case it would be ludicrous to discuss their relative merits. The proponent of modern reason, therefore, could not possibly think of participating in a dialogue on whether Christianity or Islam is the more reasonable religion, since, for him, the very notion of a “reasonable religion” is a contradiction in terms. Modern science cannot tell us that the emperor is right in his controversy with the learned Persian over what is or is not contrary to God’s nature. Modern reason proclaims such questions unanswerable by science–and it is right to do so. But can modern reason hope to survive as reason at all if it insists on reducing the domain of reasonable inquiry to the sphere of scientific inquiry? If modern reason cannot take the side of the emperor in this debate, if it cannot see that his religion is more reasonable than the religion of those who preach and practice jihad, if it cannot condemn as unreasonable a religion that forces atheists and unbelievers to make a choice between their intellectual integrity and death, then modern reason may be modern, but it has ceased to be reason. Hat tip to Red Square. Visiting the University of Regensburg, where he used to teach from 1969 to 1977, Pope Benedict XVI gave a speech in which he reflected on the Christian tradition of rational theology, and the incompatibility of religious coercion with Reason. The Pope’s quoting of a comment on Islam made by a 14th century Byzantine Emperor has, again, produced the (at-this-point only too familiar) world-wide temper tantrums on the part of the community of turban-wearers. The 57-nation Organisation of the Islamic Conference also said it regretted the Pope’s remarks. ..even in the face of such radical scepticism it is still necessary and reasonable to raise the question of God through the use of reason, and to do so in the context of the tradition of the Christian faith: this, within the university as a whole, was accepted without question. I was reminded of all this recently, when I read… of part of the dialogue carried on – perhaps in 1391 in the winter barracks near Ankara – by the erudite Byzantine Emperor Manuel II Paleologus and an educated Persian on the subject of Christianity and Islam, and the truth of both. The decisive statement in this argument against violent conversion is this: not to act in accordance with reason is contrary to God’s nature. The editor, Theodore Khoury, observes: For the emperor, as a Byzantine shaped by Greek philosophy, this statement is self-evident. But for Muslim teaching, God is absolutely transcendent. His will is not bound up with any of our categories, even that of rationality. At this point, as far as understanding of God and thus the concrete practice of religion is concerned, we are faced with an unavoidable dilemma. Is the conviction that acting unreasonably contradicts God’s nature merely a Greek idea, or is it always and intrinsically true? Apologize, my eye. What the Pope ought to do is what Pope Urban II did, and call upon the people of the West to defend Civilization against the insolent aggression of Islamic barbarism, instructing them that God wills its defense. Deus vult. 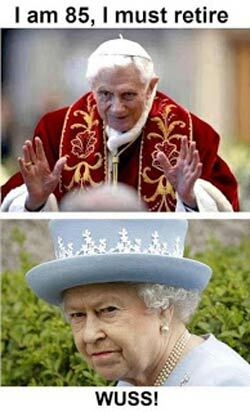 the Archives of Never Yet Melted in the 'Benedict XVI' Category.